I like keeping things clean. I doubt anyone would say much against a generalized desire for cleanliness, but the rub comes when clean is really just a substitute for right or even for perfect. No mess. No mistakes. Hardly anything in the real world actually works that way. Creativity certainly doesn’t. I was reminded of the messiness of creativity a couple days ago while I was reading Proverbs. Do you want a clean barn? Don’t have any animals. But the bounty of the harvest and the beauty of the barn are mutually exclusive. You can’t have them both. Creating means course corrections and do-overs. It means mistakes and failures and fall-on-your-face moments. At least if you're doing it right. But isn't doing it right the same as doing it perfectly? Not really. Doing something perfectly almost always comes from having already done it before, from doing only what you are sure you know how to do. Never making a mistake means that you’re probably not trying something you’ve never tried. 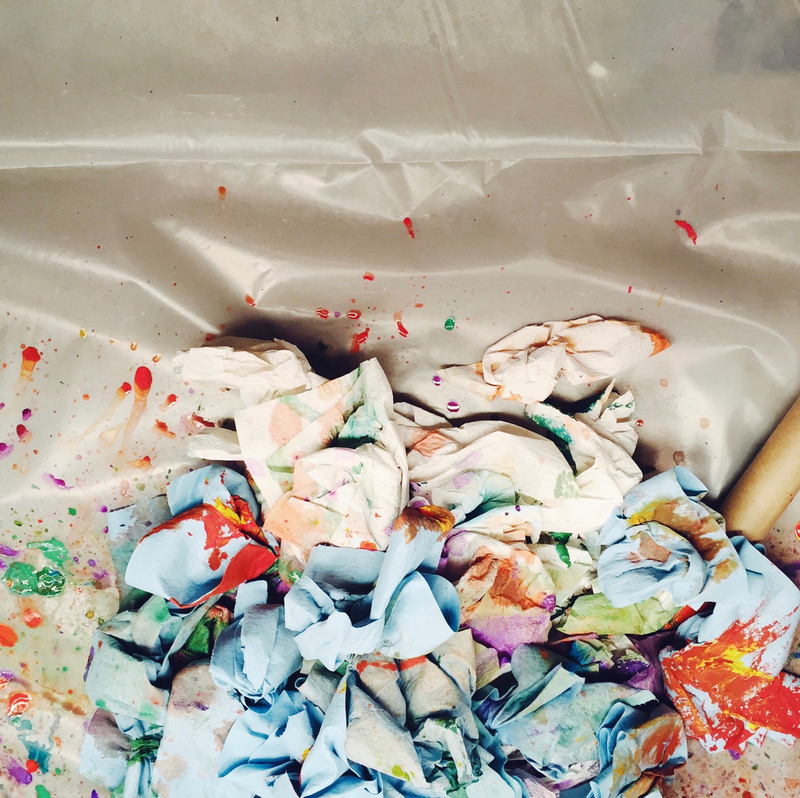 The reality is: Creativity is almost always messy. That’s kind of a nice thing to say, and an even nicer thing to imagine… The artist at work, her studio and her smock all covered in mess, and even the mess is a little pretty, made up of Pollock-esque dots of every imaginable color. But I don’t think that’s what Proverbs is talking about. Oxen don’t make pretty messes. Real messes are a little ugly, and the ugliest mess I’ve ever seen is my internal one. Yes, messier than the creative catastrophes, the failures, and the flatlines is the internal mess that gets made when my work gets real, when I decide I want to make the soil into something, when the dust gets stirred up and the rain turns everything to mud. I think I’ve been tending a clean barn and an empty field for a little while now. It’s easier, but I don’t have much to show for it. Now it’s time to get an ox. It’s time to get messy. It’s time to drag some heavy ideas from here to there. It’s time to make the earth shake a little. It’s time to plow up some new ground in my work and in my heart. It means I’m going to have to feed the ox, giving it stuff that’s of substance. It means we’ll need to work hard and rest well. And it means that the hay in the barn is going to get trampled, and things are going to get broken, and I’ll definitely need to shovel some… stuff. But it means there are abundant crops to come. I’ve never much identified with Peter, the disciple, I mean. Where he’s impulsive, I tend to be calculated. Where he’s the first to ask a question or submit his opinion; I’m often the last. I’ve always imagined him as a burly, working-class kind of guy, and I rather doubt I’ve ever been described as anything close to that. Peter and I, we’ve been more like acquaintances. Politely distant. Someone about whom I’d say, He’s a good guy. I like him, without ever putting much conviction behind the sentiment. I was on a trip to Israel, my first. I’ve written before about what I saw and what I felt while I was there. The trip was full in every way imaginable, a full itinerary full of new experiences, hard stories, heartbreak, and hope. On the very last day we all went to Galilee. For the first time in days we weren’t on a fact-finding mission or a cross-cultural collision, we were just tourists in one of the most beautiful and historical places in the world. I found myself mentally and emotionally exhausted and glad for the opportunity to set everything aside for a few moments and simply take in the scenery. 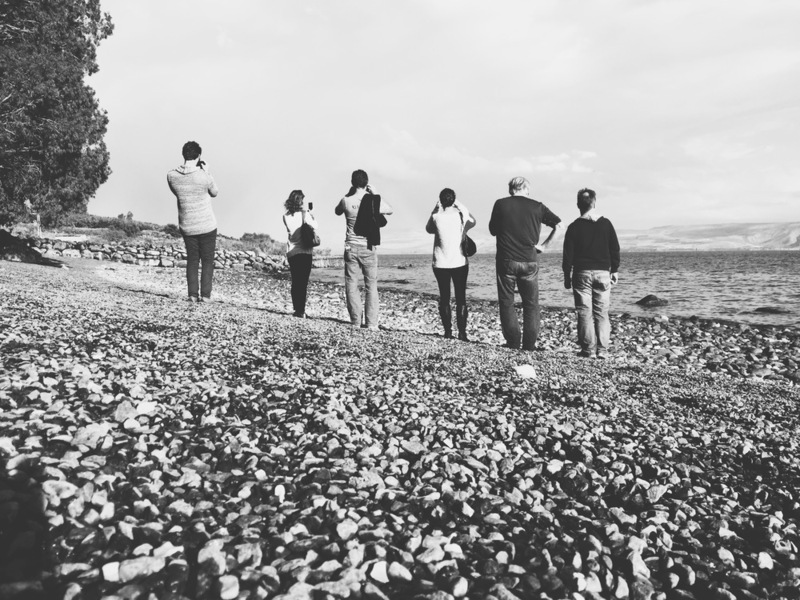 In the afternoon we were given about an hour on the shore of the Sea of Galilee. We arrived just in time to see a rainbow, and we all ran around snapping pictures to prove we were there. Finally, I sat down on one of the big rocks that littered the shoreline. I’d brought my Bible, but I didn’t have a plan. I half-heartedly turned to the concordance in the back and looked for any mention of the word “Galilee.” Soon, I was reading through John chapter 21. Easter has come and gone. Jesus is risen, but he hasn’t gone anywhere just yet. He’s appeared to a number of people, including the disciples. But we find Peter, the fisherman, in a boat with a few others. They’ve returned to their normal lives without much success. In fact, they’ve been fishing all night, but as the sun rises they’ve yet to catch anything. Then a man starts shouting at them from the shoreline. The man is Jesus, but they don’t realize it at first. He tells them to try again, tossing their nets off the other side of the boat. Suddenly, the net has so many fish in it that they can’t drag it back to the surface. That’s when Peter realizes that the man is Jesus. That’s when we reach John 21:7. When Simon Peter heard that it was the Lord, he… threw himself into the sea. And suddenly I was crying, and I didn’t know why. (Tears are not necessarily an unusual occurrence for me, and certainly not on that trip, but over time I’ve learned that if I’m crying and I don’t immediately know why, God is usually working in some way I haven’t yet noticed.) I asked God why, and I began to realize that I was experiencing a deep envy of Peter, a holy envy if there is such a thing. I wanted to be that desperate to get to Jesus. Forget the boat. Forget the catch. Forget the distance. Forget my dignity. 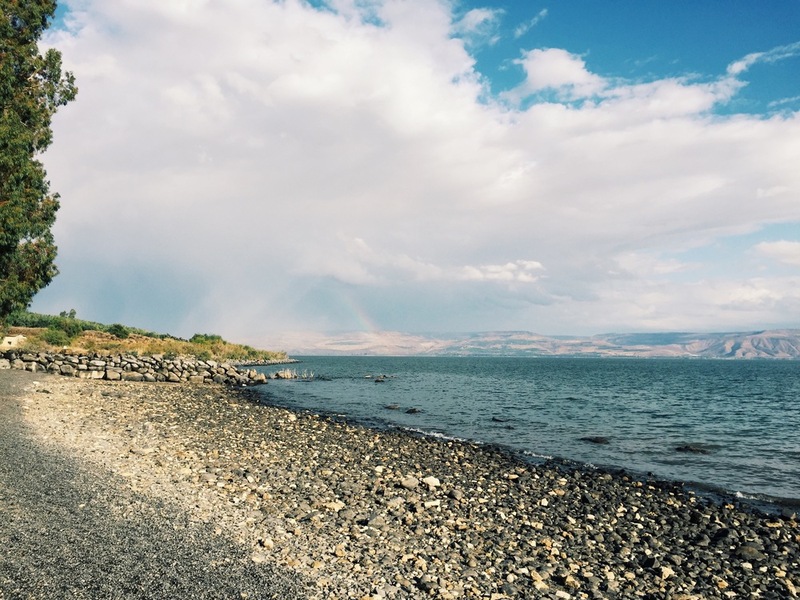 I looked up at the Sea of Galilee laid out in front of me, the gentle waves lapping against the shore, and I watched the whole scene play out in my imagination. I saw Peter’s leap and splash into the water. I saw him swimming ashore. I saw him standing there, his clothes dripping. I really saw Peter for the first time, and I wanted to know him a little better. Then, to be honest, I forgot. By the time I boarded the plane for home the tidal wave of all of my other experiences and things that needed thinking-about crashed over me. A month passed by, and then another. A deadline brought it all back. Our creative team needed to pitch an Easter idea. My partners, Jenny Potter and Andrew Schuurmann, set a meeting where we’d pool all our Easter thoughts together and see if anything floated to the surface. The night before the meeting I was frantically looking through my journal for some fragment of something that might constitute a viable idea and happened upon the entry from that day on the Sea of Galilee. Something stirred in me. That green light gave us the chance to begin to dig into who Peter really was, to study him and find his story. In doing so we discovered that Peter’s story is our story; it’s my story. When we first meet him in Luke 5 he’s a fisherman who can’t catch any fish. I can’t count the number of times I’ve failed, felt overlooked or foolish. Throughout his three years of following Jesus he is behind the curve just as much as he is ahead of it. Though I’d like to pretend that I spend most of my life in a steady uphill climb to holiness, the reality is a lot more hit and miss. In his darkest moment, consumed by insecurity and very real fear, he shouts that he’s never known Jesus. I know that there are times, more than I’d like to remember, when my actions have shouted the same. But despite all of his ups and downs, his passion and love for Jesus cannot be denied. Yes. By the grace of God, yes. Peter and I are no longer acquaintances; we are very real friends. And through him I have new eyes for Easter. I have new eyes for God’s sacrifice, his grace, and his power. I have a new desperation to get to Jesus. I have new hope that despite my darkest moments Jesus will welcome me as I stand undignified and dripping on the shore. You waited. You let them discover you. You let each of us do that, don't you? And then we throw ourselves into the sea of your grace and your forgiveness and your faithfulness and your love. And you welcome us. Because of what you did on the cross, you welcome us. My hope… my prayer… is that this Easter many more will make that discovery, that many more may throw themselves into the sea. over the things most true. the world the way I do. by the unromantic ritual of daily life,"
so romanticize the hell out of them." between puffs of his pipe. that are the biggest things in the world. I hadn't written much of anything in months other than pithy captions on Instagram photos, nor was I in a hurry to do more. My actual writing had grown stagnant, but my desire to have written was still gushing. Starting seemed insurmountable, ideas and lines flying here and there and the task of organizing all those birds in flight into the single-file lines of rational sentence structure wore me thin before I could even begin. I was explaining this wearying paralysis to a friend (read: complaining), and she looked at me with only a marginal amount of sympathy and said, "Just play." Take the pressure out of it. Stop trying to be brilliant. Make some nonsense. Write whatever comes to mind. Just write. A couple months ago, with her words ringing in the back of my mind, I made a commitment to start writing every day. Failure commenced the very next day when I wrote a sum total of nothing. But the experiment hasn’t been an all-out disaster. Most days I do write. Some days I don’t. I’m trying not to beat myself up about it, trying to extend myself a little grace. And trying to play, to have fun, but also finding that I might have forgotten how. I started small. I would try to write a paragraph at the very least, and I was doing okay. Then Anne Lamott and her lovely little bird book conspired with my inner-Achiever, and I found myself whispering to myself, saying thing like, "If you were really serious about this writing-everyday-thing you'd be writing at least three hundred words a day." Cue the musical montage depicting my five days of discipline and self-satisfaction. Smash cut to me brooding in the mirror as I brush my teeth at the end of another day in a long line of not typing a word. What this experiment continues to reveal is that I’m all for discipline, but I also need to allow for a natural ebb and flow. Without that little bit of give, healthy discipline quickly erodes into resentment, stress, and other downward-spiraling nonsense. I’ve been in a bit of a busy stretch the last week or so that’s kept me from writing for any regular block of time, so I’ve been trying something new. I just finished the book Accidental Creative (highly recommended), and it talks about doing a better job of noticing the fly-away thoughts we have throughout the day, those momentary flashes of insight or pangs of emotion that rise up in the course of ordinary conversations, commutes, and correspondence. Todd Henry (he’s the author) recommends carrying a few index cards at all times to capture these thoughts before they disappear into the ether. Well, I emphatically will not carry note cards. They remind me of homework and flash cards and public speaking, and I’ll have none of that. But I will carry my phone, and for the last week or so I’ve been capturing these fragments of thought every time I can remember to do so. And it feels like play. Out of necessity these rapid-fire snippets are often captured without a filter, a result of needing to get them down as quick as I can in the bitty breaks between meetings or stoplights. No filter means they’re rife with misspellings and non-sequiturs, but they’re also full of reality and raw originality. I look back and I see moments that would have passed by with a half-smile only to be forever forgotten. A single rhyme or instance of alliteration will materialize in my head, and in the course of writing it down it will suddenly bloom into a whole stanza (a whole stanza of really awful poetry, mind you, but a memento of a beautiful moment nonetheless, written in ugly sentence structure… like this). I’m easily topping three hundred words a day now (take that Anne!) and having a lot of fun. I feel as if I’m casting seeds, little insignificant fragments of things that just might become something really beautiful when I have the chance to coax more out of them with a little care. Sometimes making things can start to feel like a burden rather than a privilege. Or the immensity of touching the untouchable can suddenly seem too much. Or as our eyes cross with the complexity of it, the masterpiece at hand can begin to look like a paint-by-numbers. And maybe, sometimes, it is. When I'm in these dark, confining rooms called fear, worry, and complacency I sometimes need to burst out the front door. I need to feel my feet running down the street. I need to start ringing the doorbells of every neighbor with the surnames of Wonder, Laughter, and Discovery painted on their mailbox to ask if any of them might come out and play with me. We each need a place where we can experiment, and try, and fail, and withhold judgment, and maybe find a way out of these very dark rooms. We all need a way to just play.